For the most part I have been lucky with Jayden when it comes to vegetables. Jayden is a pretty good vegetable eater. In fact he eats more vegetables than I do. I know from working with children that many children will refuse to eat vegetables. Growing up I was not a good vegetable eater. Funny, but Jayden will actually choose to eat his broccoli before his pizza. But there are some things I do to get Jayden involved and interested in eating his vegetables. 1. Start early! With Jayden I ate many vegetables when I was pregnant. I didn't have too many weird cravings, but I know that I often wanted and ate broccoli. This is probably why Jayden LOVES to eat broccoli. I also recommend starting with vegetables in the baby food stage. I gave Jayden a little of each of the vegetables before moving on to the fruits. Jayden already loved his vegetables and I continued to give him vegetables as I introduced fruits and other foods. 2. Go Shopping! Let your child help you to pick out vegetables at the store. Let them pick out what they want and help to count how many you need. Jayden loves to count when we are shopping. He gets to pick up the items and put them in our bag. 3. Grow your own! 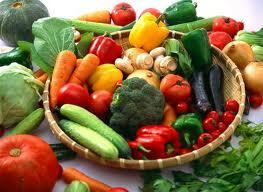 A great way to get children interested in eating vegetables is to have them help you in growing the vegetables. I have not started a garden with Jayden yet, but while I was working in the classroom we had a garden. In my classroom we would tend to our garden daily and as the vegetables were ready we would pick them, clean them and taste them. The children love to participate in the whole process. Growing up we always had a garden and I very much remember the zucchini that my mom would grow and cook for us. 4. Be Creative! Prepare the vegetables in different ways. Many vegetables can be cooked or eaten raw. Everyone has different taste and maybe your child doesn't like carrots cooked, but likes them raw. Preparing your child's vegetables in different ways can help increase your child's likelihood of trying them. 5. Juice it! Use a juicer and turn those veggies into a tasty juice. We have a large juicer and John often will put an array of vegetables in to make a juice drink. 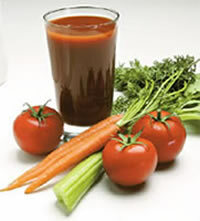 He will include things like carrots, beets, parsley, spinach, celery, and an apple. The apple helps the juice to have a little bit of a sweet taste. Jayden loves this juice. 6. Be the Model! Children learn best by watching you. If you eat vegetables then they are more likely to want to follow you and eat theirs too. I have to admit I am not always good at this one. I do like some vegetables, but I am not super adventurous in that area. I was allergic to many vegetables growing up so I am still hesitant to try some for fear of an allergy. But I try to model whenever I can. I show Jayden that I really like my vegetables. 7. Make it the Norm! I include vegetables in most every meal for Jayden. Even when I just send a peanut butter and jelly sandwich to the sitters for lunch I will include some peas and carrots. Jayden just expects to have vegetables with his meals. 8. Sauce it! Children love to eat anything they can dip. Of course most people like to dip their fries in ketcup, but what about using low fat ranch or low fat cheese dip. Like I said before while pregnant I ate lots of broccoli and the main way I did it was raw with a ranch dip. This is both mine and Jayden's favorite way to enjoy broccoli. 9. Add Variety! Children easily get bored when they get the same thing over and over. I do to, don't you? Try to mix it up and add variety. Don't give them carrots everyday. Try to switch it up and make it fun to eat veggies. 10. Repeat, repeat, repeat! Children need many opportunities to try vegetables. Although they might not like them the first time you offer them the next time may be different. They say it takes many trys for someone to form a taste for something. Don't stop offering and assume your child doesn't like that vegetable. Keep offering vegetables in a variety of ways on a variety of days. Like I said I was pretty lucky when it comes to Jayden and eating vegetables. I am at a point where I want to find more ways to prepare vegetables and I am hoping to try some new vegetables with Jayden soon. Just last night while out for dinner John got a plate of raw veggies along with his chicken. Jayden immediately went for the veggies before his hamburger. I was still holding back giving him too many of the raw vegetables worried about choking. But he jumped right in and loved the raw carrots, celery, and cucumbers. I plan to stock up on some baby carrots, cucumbers, and more. I am also hoping to add some more vegetables and recipes to our diet. What do you do to encourage your children to eat their veggies? Do you have any good recipes that your children love? I would love if you shared.